CUPERTINO, CA (PR Buzz) – December 22, 2016 – Were you happy or surprised with the results of the Presidential election? Either way, we have a result and its one that the country needs to live with. As a first-time president and first-time politician, we all want President Elect Donald Trump to be successful. Want to share your advice and that of your friends? AHAthat™ is giving you a chance. Write an AHAbook™ in the Dear Donald series and receive a full scholarship. How can America be the best it can be? What advice, wisdom, inspiration do you have? 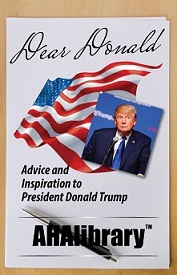 Authors who write in the Dear Donald series will be compiling 140 bite-sized quotes of advice, inspiration, and words of wisdom. Words of hate will not be tolerated. To apply for your scholarship, please go to this page http://ahathat.com/author, fill out step one and state that you're writing an AHAbook in the Dead Donald series and we'll confirm that you have a scholarship. AHAthat makes is easy to SHARE, AUTHOR & PROMOTE you. As the first AHAleadership (Thought Leadership) platform on the market, it allows you to 1) Easily build your brand by sharing others' quotes with proper attribution and 2) Show your expertise by creating your book in 8-10 hours and having others share your quotes. There are over 35k quotes from recognized AHAleaders that you can share in seconds for free. All content on the platform is curated by THiNKaha which has published over 800 physical and eBooks. THiNKaha makes it easy to create compelling content that helps turn corporate experts into recognized thought leaders. THiNKaha services include: Curation for the Aha Amplifier, Thought Leadership Mentoring/Coaching, Book Publishing, Social Media, Traditional Media Coaching, Vetted Referrals, Producing and Repurposing Content for Shows like Thought Leader Life, and many other Thought Leadership Services, including the Creation and Support of Corporations' Thought Leadership Blueprints.